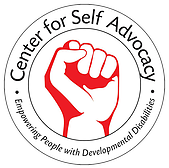 The Center for Self Advocacy assists individuals by implementing a person-centered approach through peer support and enhancing the quality of life by fostering independent living skills. Our services promote equality for people with disabilities and enable them to be productive members of society. They offer workshops to promote self advocacy, peer-to-peer support training and disability awareness training.